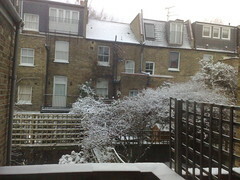 Woke this morning to another sprinkling of snow in London. Probably more outside of town, but haven’t checked yet. Not much but clearly it came down through the early morning when there were fewest people about so it’s thicker than it would have been if it had come down at 4pm. And then I thought “Hang on, isn’t this what winter’s *supposed* to be like?” We’ve become so accustomed to having only a few individual days of snow that having a prolonged cold snap with associated precipitation feels out of the ordinary. It’s the corollary of “Oh, we had a sunny day, that’ll be our summer then!”. But didn’t it used to be like this all the time? Why shouldn’t winter have a fortnight or so of snow and ice? Has anything actually changed here? Why is this so important? And so, yet again, I’m left wondering whether it’s the world that changed or that my dislocation is a result of warped perception. Is it them or is it me? Usually the answer to that question is… errrr… yes it’s me so forget it, ignore what I just said and let’s get on.